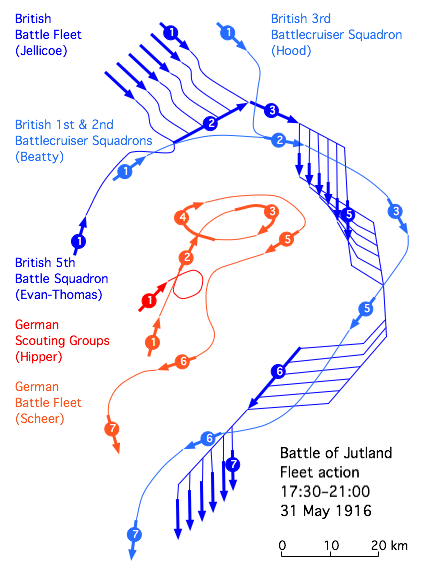 In the North Sea to the west of Jutland the British battlecruiser squadron under Admiral Beatty is running north, hotly pursued by the main German fleet. If the Germans can catch and destroy the British they will have shifted the naval balance decisively in their favour. But Beatty is leading them into a trap. The main British fleet under Admiral Jellicoe is steaming south to join the battle. Admiral Scheer commands the German fleet. Just when he thinks he has caught up with the battlecruisers he realises the deathly danger he is in. He is sailing straight towards the main British fleet, whose ships are lined up to fire all their guns upon him. However, visibility is poor. He reacts quickly, ordering his ships to make an about turn before the British capitalise on their advantage. In the bad light of the early evening the two fleets now bumble around, the Germans hoping to escape and the British hoping to catch them. A second time the Germans find themselves sailing towards the entire British fleet, but again they manage to about turn before they are obliterated. Finally night falls. Under cover of darkness the Germans slip away. Jellicoe is happy to let them go, as he does not want to risk his fleet in a chaotic night action. The two fleets head for home. The largest naval battle in history is over. British losses are greater, with over 6,000 men killed and three battlecruisers sunk, while the Germans have suffered more than 2,500 men killed and lost one battlecruiser and an obsolete battleship; both sides have lost several smaller ships. However, neither side has landed a killing blow and Britain continues to enjoy the naval dominance it had before the clash. The German fleet puts to sea, hoping to catch a portion of the British fleet at a disadvantage. Unfortunately for the Germans, the British have cracked their radio code and know that something is up. The entire British fleet is also out in the North Sea. The British fleet is considerably larger than the German; in a straight fight between the two, the Germans would face destruction. The overall British commander is Admiral Jellicoe. He is cautious, knowing that if his fleet is defeated it could hand victory in the war to the enemy. But Admiral Beatty, his subordinate and the commander of the British battlecruiser squadron, is more daring. He dreams of a glorious victory like that of Nelson at Trafalgar, one that would eliminate the threat posed by the German fleet. North west of Jutland, a British cruiser encounters the German battlecruiser squadron. Beatty’s squadron raises full steam and races to engage the Germans, leaving behind the rest of the British ships. The German battlecruisers retreat before Beatty’s superior force. 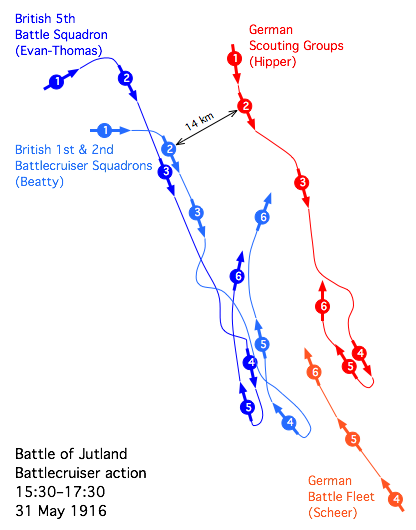 A race south then ensues, with the two squadron’s trading fire as they go. German gunnery appears to be superior. “There seems to be something wrong with our bloody ships today”, Beatty exclaims, when enemy shells cause a second of his battlecruisers to explode. Then Beatty’s squadron finds that the German battlecruisers have led them to the main German fleet. Rather than face battle on disadvantageous terms. Beatty orders his ships to make an about turn. The Germans chase him northwards, not realising that they are rushing towards the massed guns of Jellicoe’s dreadnoughts. The carnage at Verdun continues. On the east bank abortive French counterattacks have failed to recapture Fort Douaumont. On the west, the Germans continue to apply the pressure. Côte 304 has already fallen. With its machine guns eliminated, the German are able to make their final assault on the Mort Homme. This sinister piece of high ground has bedevilled their efforts on the west bank of the Meuse since the start of fighting there. Now the Germans are determined to seize it. The Germans assaulting the Mort Homme are led by Eugen von Falkenhayn, elder brother of the army’s chief of staff. After brutal fighting they finally secure the aptly named hill, now littered with French and German corpses. With the French pushed back on the west bank, the Germans are ready to renew the offensive on the east. The goal now is to take the two forts of Vaux and Souville and then press on to seize Verdun itself. The final crisis approaches. The Austro-Hungarians’ Trentino Offensive has shaken the Italians. Conrad’s men are increasingly exhausted by the fighting and are outrunning their supply lines, but he still hopes that they will be able to break through to the plains and reach the coast, cutting off the main Italian army along the Isonzo. On the Italian side, Cadorna is desperately trying to stop the onslaught. He has formed a new army to block the enemy’s route to the sea. Half-trained conscripts are being handed guns and sent to the front. Cadorna has also secured the recall of the troops that were sent to Albania in pursuit of Italy’s ambitions there. The Austro-Hungarians are not Cadorna’s only enemies. The success of the Austro-Hungarian assault, combined with the Italian army’s clear lack of preparation for it and the series of failed assaults along the Isonzo, has led to Prime Minister Salandra thinking that it might be time to get rid of Cadorna. The King accepts that Cadorna will have to go, if Salandra has full cabinet support for his ouster. However, when Salandra meets the general, he finds him assured and confident, predicting that the Austro-Hungarian offensive will be contained. Salandra is gripped by indecision, worrying as to who will replace Cadorna and whether the current time of crisis is the right one to change military commanders. Cadorna keeps his job, for now at least. Britain remains the world’s pre-eminent naval power. The Royal Navy enforces a blockade of Germany that is strangling the enemy’s industry and making its people increasingly go hungry. Germany also has a substantial navy, albeit smaller than the British. It is commanded by Admiral Scheer. He hopes to find a way of defeating the larger British fleet. If Britain were to lose its naval dominance then Germany would surely win the war, as the blockade would be at an end and Britain itself could be invaded. The German fleet makes ready to set sail tomorrow. Scheer has a plan in mind. His battlecruiser squadron will patrol aggressively, attacking British shipping to the north west of Jutland. The expectation is that British battlecruisers will respond, whereupon the German will sail south, to draw the British towards the waiting guns of the main German fleet. Unfortunately for the Scheer, the British have cracked the radio code used by the German navy. They intercept a signal revealing that a major operation will take place tomorrow. Though they do not know the details of Scheer’s plan, or even how many of his ships will be setting sail, they decide that their own fleet will head out to the North Sea tomorrow to block whatever the Germans are up to. The stage is thus set for the greatest naval clash in human history. Austro-Hungarian forces are continuing their advance against the Italians. The Austro-Hungarians are advancing from the Trentino uplands, hoping to break through to the plains and reach the coast, cutting off the Italian forces on the Isonzo. Now they seize the key town of Asiago. The lowlands are not far away. Italy’s Cadorna is rushing every man he can to face the Austro-Hungarians, but the enemy seems unstoppable. He warns the government that if the enemy’s progress continues, he will have to withdraw to the gates of Venice itself. In desperation, Italy’s leaders beg the Russians to bring forward the offensive they have planned for mid-June. If italy’s allies do not come to her aid it looks disturbingly like Austria-Hungary will succeed in knocking her out of the war. Britain was the only one of the major combatants to begin the war without a large standing army. 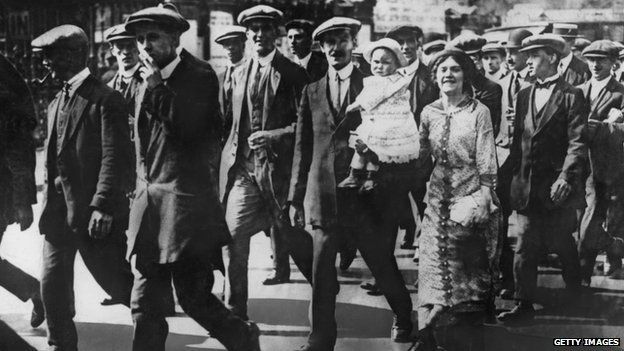 The other nations conscripted men into their armies but Britain had a comparatively tiny army comprised only of people who had voluntarily enlisted. This army was too small for the war that Britain found itself fighting. Initially the British authorities appealed for volunteers to make up the army’s numbers. That initially yielded a large number of men but as the carnage of the conflict became more apparent it became harder to find sufficient volunteers. Earlier this year Britain began to conscript unmarried men into the army. Now the recruiters’ net is widened as married men too find themselves summoned to the colours. This may be because of fears that shirkers were entering into ill-starred marriages as a way of avoiding their martial duty. Conscription continues to apply only to England, Scotland and Wales. Given the recent rebellion in Dublin it seems wise to not provoke the Irish.